When I got this book, my feelings mirrored grimoire scholar Alan Thorogood's reaction to Skinner & Rankine's transcription of Enochian material "interest turned to bemusement turned to exasperation". Some of the supporting material is not very well researched and independent editorial input might have prevented several egregious errors creeping in....the hypothesis... is not supportable by any stretch of the imagination. as this applies also to elements of "Techniques...", although I would add that some of what he writes concerning the PGM seems to me to be downright deceptive and he appears to be riding on the safe assumption that most of his readers will be overwhelmed by the PGM and so unlikely to notice the not-so-occasional fudge. One thing that stands out to me from the book first appears in the section titled "Circle of Protection". He admits that there are only two occurrences of circles drawn on the ground, (and, I should add only one of which the magician stands upon), but supports his argument that circles are commonplace in the PGM by saying that we can assume the reason circles are never mentioned is because their use was taken for granted. In a number of passages the phrases "do the usual" or "add the usual," occur, indicating that well-known background procedures were not usually specified in the PGM. This may also have applied to prefatory procedures such as drawing the protective circle. The fact that a circle appears to be only mentioned several times in the whole corpus of the PGM suggests that the circle was taken for granted. This is simply bunkum. He is very subtle when he describes the phrase in question as "do the usual" for this turns it in to a command to perform a specific act. The truth is, I can't think of a single occurrence of "do the usual" in the PGM. As far as I am aware it is always "add the usual". 'Common', 'ordinary', 'profane' - hardly descriptors for a magic circle, but the definitions of the word in question. I have done a brief survey of occurrences of Koinos and its variants in the PGM, and I won't bore you with them here, suffice to say, it always comes at the end of a section which is spoken or written on a lamella and it always is a direction to add your request to the god. It is never a further ritual instruction, being in fact the complete opposite, an instruction to break from the ritualised speech and proceed in the common tongue to dialogue with the spirit. Most notably, throughout PGM VII occurs the phrase "add the usual, whatever you want" at the point where you are directing the spirit to carry out your wishes. I'm not a fan of Skinner's recent work (anything he's self-published under his Golden Hoard imprint, really) and reading the thesis hasn't changed my opinion. The PGM are not my area, so it's helpful to know that some of his assertions regarding the papyrii are as weak as those concerning the early modern manuscripts he discusses (which are in my remit). It's odd that things like the point you make weren't challenged by his supervisors: this was a classics doctorate and I'd expect them, as lecturers in classical languages, to notice the weakness of such arguments. Neither of his supervisors were, according to their CVs, historians of magic, so I wouldn't expect them to pick up on the other flaws, such as Skinner's reductive definition of what Solomonic magic is - he's far too ready to ignore those manuscripts that don't conform to his ideas - and reliance on rather late supporting material (he frequently cites his own books, for example). But he has far more supporters than detractors and I'm fairly certain most of his readers will just believe what he says because he's a "name". Especially now he's "Dr Stephen Skinner". Skinner used to be a member of SA. I tried to make an entry about him on SA Encyclopaedia of humans, but it was just too much information for me to handle at that moment and I had no free time. Anyway, SA has its own style and logic. When I get time, I think that once I summarise opinions of all members who said something about Skinner and his work, we will come as objectively close to the truth as possible. Thanks for the link, Ged. Skimming through it, I can see he has taken a lot of tables and elements from his published works and put them all together in one place. As a thesis on common threads running through the publications of Golden Hoard publishing it is quite comprehensive. I had assumed his PHD supervisor was a doctor of leisure studies and that was why these things were not picked up. I see he even got the "do the usual" fudge through without them noticing. I thought some of these elements might only be in the published book but not in the thesis. I guess he picked a university where he could be sure the tutors had no knowledge of the PGM, or magic at all. I'm amazed that even his thesis contains the assertion that the very absence of the circle in the PGM means it can be taken for granted. I thought when you write a PHD thesis you are supposed to have water-tight arguments supported by textual evidence, but here he is just making stuff up, and even stating that he is doing so. Maybe it has something to do with him living in Singapore and his PHD coming from Newcastle. I know universities get a lot of money for study abroad students. I must say, I do like Skinner's occasional joke at the expense of the uncritical reader. On pp201-2 he quotes from PDM xiv 90 which describes a phylactery made from a linen band wrapped around the body of the scryer, stained with hoopoo blood. Skinner reinterprets it to be an instruction to bind a live hoopoo to the scryer! Actually I had done this review about Skinned, but I forgot. It is above. Those are not my ideas, but the ideas from the members of this forum. I have not read Skinner, so I have no personal opinion about it. I bought this book a while ago and read about half of it. I've had my attention elsewhere but I intended to use Skinner's book as a giant index of the PGM. I found it to be less analytical than more of a catalog of the contents of the PGM. 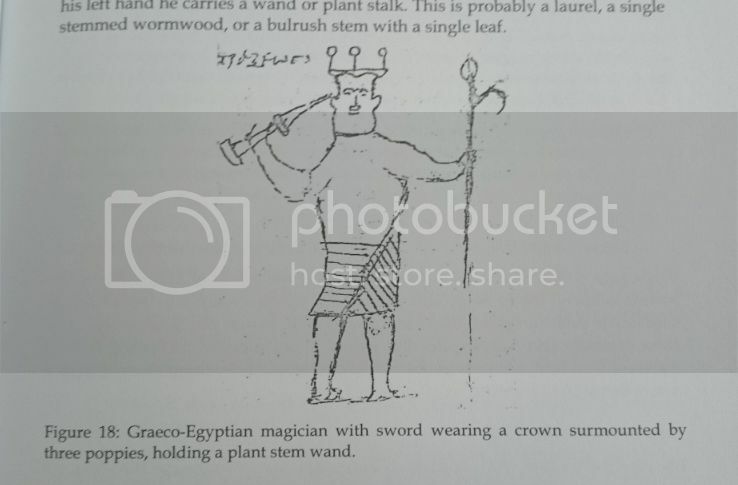 As far as who is pictured in the illustration I take it you are suggesting it is not the prototypical Greco-Egyptian Magician. The "Dying God" then? An Adonis, Osiris, Jesus, Tamuz type character? I'm not near my copies of either book to look at the reference. Moonlit Hermit wrote: As far as who is pictured in the illustration I take it you are suggesting it is not the prototypical Greco-Egyptian Magician. The "Dying God" then? An Adonis, Osiris, Jesus, Tamuz type character? I'm not near my copies of either book to look at the reference. You're very warm with these answers. He has a specific name though, and is a very famous character from the PGM, discussed elsewhere in this forum. Nashimiron wrote: I'm amazed that even his thesis contains the assertion that the very absence of the circle in the PGM means it can be taken for granted. I thought when you write a PHD thesis you are supposed to have water-tight arguments supported by textual evidence, but here he is just making stuff up, and even stating that he is doing so. Maybe it has something to do with him living in Singapore and his PHD coming from Newcastle. I know universities get a lot of money for study abroad students. It's Newcastle in New South Wales, Australia, which has a campus in Singapore. I don't think Australian universities demand a viva voce with an academic opponent, so he would have been examined on the written research alone and the outcome rests on the knowledge of his supervisors. (who do not have a lot of experience in the history of magic so far as I can tell). There are all sorts of problems with the thesis in my opinion. The troubling thing is that Skinner’s confirmation bias runs through the whole dissertation. He either ignores or glosses over evidence that undermines his argument. One of the things he ignores is the assertion made by Jean-Patrice Boudet (professor of medieval history at the University of Orléans and general editor of the Micrologus “Salomon Latinus” book series), presented in two of the works listed in Skinner’s bibliography, that the Latin Clavicula Salomonis probably emerged in the second half of the thirteenth century and that copies were known to be in Italian libraries at the beginning of the fifteenth (see Boudet’s Entre Science et Nigromance (2006), 354-357 for example). It’s relevant to his thesis but I think Skinner ignored it (just as in the same way he quickly dismisses the other late medieval magical works attributed to Solomon) because it’s inconvenient. In light of Boudet’s dating it becomes possible that the Clavicula Salomonis and the Hygromanteia could well have emerged in parallel, or even worse for Skinner’s argument, the Clavicula Salomonis is the earlier of the two texts and could have influenced the Hygromanteia instead of the other way round. All Skinner can offer by way of an alternative earlier dating is his weak and jejeune argument that because a mid-fifteenth century copy of the Hygromanteia shares its title (Apotelesmatike Pragmateia) with a seventh-century work of the same name then it must be descended from the earlier text. Even though all the known versions of the seventh-century work, attributed to Stephanos of Alexandria, deal with astrology and not ritual magic. Then, without any real evidence Skinner suggests that a magical text might also have existed and so based on no more than speculation claims Stephanos as the author of the Hygromanteia. What’s extraordinary is that he goes on to say he will withdraw the claim only if someone offers “a better candidate for authorship” (“Magical Techniques and Implements [etc]” thesis, 114). In other words he seems to think it’s not for him to prove he’s right, it’s for others to prove he’s wrong. Not only that, he also expects them to identify the author of an anonymous manuscript. It’s an odd thing to find in a thesis at this level and for me reads more like the declamation of a petulant undergraduate than a doctoral candidate. He’s used the same obstinate tactic again at the end of his introduction to the recent John Dee’s Spiritual Diaries (2011): it’s clear that it’s not enough for him that Egil Asprem and other critics of his work have proved that Thomas Rudd couldn’t have written the “Enochian tables” manuscript, he now says he wants an “alternative and viable name” before he’d reconsider his position (op. cit. p 35). It’s pathetically evasive and he hasn’t helped his case by citing two pieces of spurious evidence in support of his “Thomas” claim. I’d reconsider my position if Skinner can provide chapter and verse for the two pieces of “evidence” (by which I mean something other than quoting his own books as if they’re the final word on the matter), but I already know he can’t, because I already know they are spurious. On the subject of citing evidence I was surprised to notice, without looking too hard, instances in Skinner’s thesis where he failed to properly reference or source statements he made. He’s done this before but it’s one thing finding it in his self-published books, quite another in a doctoral thesis where academic integrity is a factor and failing to acknowledge sources can more readily give rise to accusations of plagiarism. Here’s just one example: at p 94 of the thesis he refers to a letter by “G. G. I. E. of Antwerp”; both this and the information in note 343 are taken from Eileen Reeves’ “Occult Sympathies and Antipathies: The Case of Early Modern Magnetism” in Wolfgang Detel and Claus Zittel (eds), Wissenideale und Wissenkulturen in der Frühen Neuzeit (Berlin 2002) 97-114 (see 101–102), but Skinner doesn’t credit Reeve’s article in his notes, nor is it listed in his bibliography. There are others and this type of thing should really have been spotted by his supervisors, as should the inconsistencies scattered throughout the thesis. There’s also his misrepresentation of something written by Ronald Hutton. Skinner mentions Hutton’s dividing of the evolution of western ritual magic into three periods, the second of which (15th-16th centuries) is “grimoire magic derived from the hygromanteia” (“Magical Techniques and Implements”, 35). The thing is, Hutton doesn’t actually say this and particularly he doesn’t mention the hygromanteia. He does write about a Byzantine Greek influence in this period, but only with reference to the translation into Latin of the Corpus Hermeticum and the rediscovered works of Plato and the Neoplatonists, and their influence on Ficino, Agrippa, Bruno, etc; magical manuscripts only receive a couple of brief sentences (Hutton, Witches, Druids and King Arthur (2003) 173-191). It must have served Skinner’s purpose to pretend that Hutton had written something that agreed with his own theory, but we’re back to confirmation bias again, only this time with added misrepresentation. There’s much more I could say about the issues I found with the thesis, but I’ve labored the point enough. I will just add something that made me laugh out loud when I read it. It’s the spell at p 343 of Skinner’s thesis supposedly taken from a sixteenth century manuscript in the British Library (“Make a drawing of Besa on your left hand …”). Skinner’s source was C.J.S. Thompson’s Mysteries of Magic (1927), a broad and not very reliable book which can be frustrating. I remember once spending hours searching through microfilms of different manuscripts for the source of something he quoted. This spell on the other hand is an easy find: it’s not from a manuscript at all, instead it’s copied from E. A. Wallis Budge, Egyptian Magic (1899) p 216. You can tell Budge was Thompson’s source because the text is identical and he copied Budge’s typo, “blood of a cow” instead of “blood of a crow”. So, Budge translated the spell from British Museum Papyrus 122, and from there it’s easy enough to find the text in Greek Papyri in the British Museum (vol. 1, 1893) 118-119, Preisendanz’ Papyri Graecae Magicae (vol 2, 1931) 48-9, and finally Betz (PGM VIII, 64-110), which Skinner does mention in a different part of his dissertation. Egyptian Magic is in Skinner’s bibliography and I don’t know why he didn’t make the connection, especially because PGM VII 222-249 and VIII 64-110 cross reference each other. More to the point, if Skinner really believed there was a 16th century manuscript in the British Library containing this spell, why he didn’t try to track down the original? He calls it an “extraordinary survival” and yet lacked the intellectual curiosity to look for it. Or maybe he did, found it came from Wallis Budge after all but decided to leave the claims about this non-existent 16th century manuscript in his thesis because it helped support his arguments about the survival of these texts. Either way it doesn't reflect well on him. Or his supervisors for that matter. Anyway, I'll stop here because I've come full circle: the image you posted appears at the end of PGM VIII. I've gone on for long enough and it's not as if Skinner will care about it. After all, I'm just the latest anonymous, nitpicking critic! Wow Ged, thanks for the detailed response. It seems Skinner's work is as bad on the Solomonic side as it is on the PGM side. 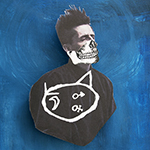 The pic I posted is indeed Bes as Akephalos, from the spell where you draw him on your hand. Skinner includes it in his section on the ceremonial sword where he continues his argument from the section on the circle, that the very fact that no rites call for the use of a sword shows that its use was taken for granted and hence prolific. The image of Bes with the caption identifying it as a PGM magician with sword is no doubt intended to bolster his argument. Nobody with any familiarity with the PGM would in all innocence make a mistake like that because the image is clearly identified in the text.